The Riverland Paddling Marathon has been run in one format or another on the beautiful Murray River in South Australia since June 1988. Previously referred to as the Murray 200/100/Relay it took a group of adventurers with great foresight to test their mettle on that first weekend and in doing so give birth to a new and great paddling event. In that first year the Murray 200 was conducted for the first time due almost entirely to the efforts of legendary paddler, Ron Bath. 46 paddlers in 32 boats started in the event. In the first year two short courses were offered, a 66 km and a 40 km course. Only one person paddled the former and eight the 40 km course. What got our race off to a good start was the fact that Ron Bath roped in David Rizolli and Gerry Brayne as Race Starter and Commentator, roles they were accustomed to in the Red Cross Murray Marathon. Their professionalism and wit were a tremendous success which continues to this day.The following year, 1989 was the beginning of the Murray 100 as we know it and the Relay a year or two later. The Race results from that first Murray 200 include some familiar names still well known in canoeing today. Ted Jackson (deceased), Robyn & Ian Pope, Rob Wight, Derrick Stevens, Graham Mitchell, Don Gomer, Jim Murphy, John Hales and of course Ron Blum. 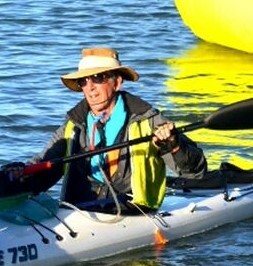 Ron Blum (photo) paddled in a single that first year and four paddlers from the event decided to team up later that same year for the Red Cross Marathon in a K4 in the Vet50 class. It had never been done before in Vet40 let alone Vet50. We genuinely wonder if we would consider such a crazy yet enjoyable adventure today? Probably not but we all owe a debt of gratitude to those who came before us and started something that continues strongly more than 20 years later. The RPM attracts some very special people and it is probably the characters and personalities that make the event great. The following profiles are just a small selection of those who have been long term supporters and have made the event what it is today. John Clarence Hales was born at Alberton, South Australia on 3rd February 1936 the State’s Centenary year. He was born within a stone’s throw of the Alberton Oval and naturally became a Port Magpie supporter. He went to school at Woodville Primary followed by Adelaide Technical High School in Adelaide. During his school holidays he worked on his cousin’s dairy at Wall Flat (near Mypolonga) milking cows and other chores. John first started paddling at the age of 12 on the upper reaches of the Port River an area that later became West Lakes. His first canoe was wooden framed covered with canvas as most canoes were in those days and he named it “Sonja” after one of his bovine friends in the dairy. At this young age, two legged girls had not come on the scene!John’s early paddling on the Port River obviously paid off as John participated in many organised events over the years and became an all-round sportsman including running and playing hockey at an elite level. (He is a Life Member of the Southern Districts Hockey Club). He competed in two Six Day Triathlon events comprising 2 days of cycling (371 km), 2 days kayaking (75 km), 2 days running (105km). It is in kayaking that John excelled. He competed in ten Red Cross 400 km Ultra-marathons, eleven Murray 200’s, six Murray 100’s, three Duke of Edinburgh 24-hour Marathons and in many State Titles and Master’s Games. He excelled in these gaining many first place medals. 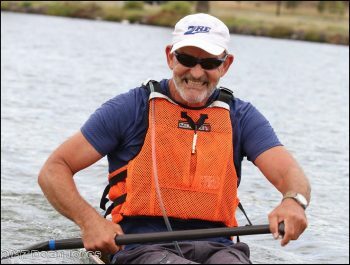 John is a Life Member of both the Onkaparinga Canoe Club and the Marathon Canoe Club and in 2000 he was awarded the Australian Sports Medal for services to sport. John is a doyen within local paddling and a friend to everyone. For years he has served the Marathon Canoe Club as Treasurer and Equipment Officer. He has towed the canoe trailer all over Australia so that paddler’s canoes and equipment arrive at the correct place and on time. John built and maintained the club trailer to keep it roadworthy. He is a “father-figure” at the Onkaparinga Canoe Club” where he built and fitted out the boat shed with its canoe racks and partly constructed the clubrooms. As Quartermaster, John maintained the canoes for many years and kept them in good working order. Over the years John has meticulously kept a diary in which he has recorded all of the daily events in his life. Within he has recorded every outing on the Onkaparinga River, clocking up over 50,000 km of paddling and passing under the road and rail (old) bridges about 10,000 times. Most of this, paddling with his mate Ron Blum. When the mangrove population in the river was reduced to one solitary mature plant following a flood, John & Ron set to work propagating new seedlings over a period of several years such that today over a 100 plants are now thriving. In 1995 John joined Ron on an eight day adventure, paddling the Gordon Franklin Rivers in Tasmania accompanied by Ron’s daughter and husband and all is recorded in his diaries. What a record. But above all this John is a thorough gentleman and friend to all. The chance find of a homemade canoe at Taperoo in 1944, when Ron was a ten year old, started what was to become a keen interest in paddling on flat water and in the sea. Ron recalls this “canoe” was fashioned from a sheet a corrugated roofing iron and was very unstable due to it being higher than it was wide. When his dad saw this boat he promptly cut it up which probably saved Ron from a misadventure in the water. As a teenager Ron built two canoes (canvas on wooden frame construction) and in the 1970’s when his children were old enough the family enjoyed paddling together in kayaks. The sea has always been of interest to Ron, providing that extra challenge for a kayaker. He has paddled from Cape Jervis to Kangaroo Island on no less than six occasions and an open water group trip to Reevesby Island. 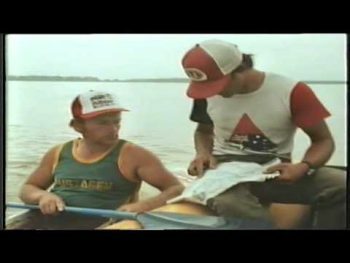 Prior to the formation of the Marathon Canoe Club Ron was in a group of social paddlers who went to the Murray and explored various back waters. These paddlers included Ian and Robyn Pope, Lawrie and Anthea Shem, Ted Misiewicz and Ron Bath. In 1984 the Marathon Canoe Club was formed with Ron a founding member, competing in the club’s first event the 28km Blanchetown to Swan Reach race. Twenty years on Ron once again paddled in this race and helped the Club celebrate its 20th anniversary in 2004. When the Murray 200 event commenced in 1988, Ron was one of the first paddlers to compete and in 1992, together with Graham Voss and Graham Mitchell, was recognized for having paddled 1,000km in this event. In 1991 Ron volunteered his services as Chairman of the Marathon Canoe Club and under his leadership the new committee reinvigorated the club. 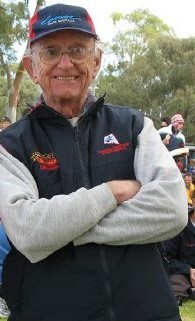 Ron was the Murray 200 Race Organiser in 1993 and again in 1994 both being successful events for the club. The Red Cross Murray Marathon also attracted Ron’s interest and he has successfully completed seven of these demanding ultra marathon events of 404km over five days. In one year Ron was in a K4, which was the first time a Vet 40 team had entered. The late Ted Jackson was another ultra marathon paddler who Ron admired and they teamed up for interstate marathons and Masters events. Ted was an unassuming man and Ron took the time and effort to have Ted’s Australian record for the longest inland waterway paddle to be recognised in the Guinness Book of Records. Ron has also freely given his time and expertise to other marathoners paddling the length of the River Murray. He was a support paddler for Ron Bath when he started on his reverse Murray paddle starting from Goolwa. Ron’s experience on the notoriously changeable Lake Alexandrina proved invaluable when he paddled across the lake with Mick Alford who broke the record for the fastest Murray paddle in the early 1990’s. In 1990 Ron guided Carol and John Wilson on the last day of their Murray paddle with Carol becoming the first female to complete the 2,400 km journey. Bill Robinson on his Murray adventure appreciated Ron’s support (together with other MCC members) when he crossed the lake in early 2005. The Marathon Canoe Club has always been part of Ron’s canoeing life and after a number of years on the committee Ron continues to serve the club as a very meticulous keeper of the club race records and competes in most club races. Ron has certainly earned his Life Membership of the Marathon Canoe Club. 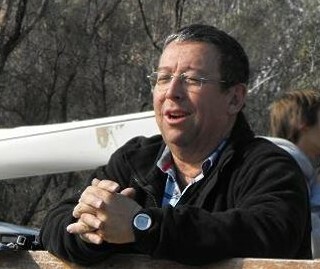 Bill Robinson is known to most marathon paddlers in Australia. Bill has a very long history of ultramarathon flat water paddling and has been quoted as saying that the Murray 200 is the toughest event he has ever done. A retired veterinarian of long standing in country Victoria, Bill is a passionate sea kayaker and marathon paddler. 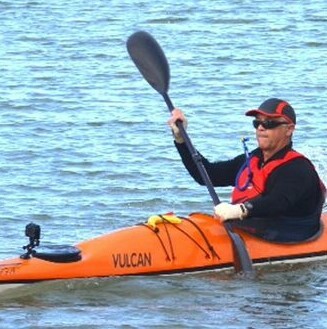 A member of the Victorian Sea Kayak Club, Bill is possibly best known for ensuring the Murray400 survived as an event after the Red Cross organisation withdrew after 40 continuous years. As mentioned Bill has a long history of sea and recreational kayaking in particular the Murray 400, Hawkesbury and Murray 200. His training regime is uncomplicated, simple and obviously enjoyable, “I just make sure that I am paddling long distance on a regular basis”. 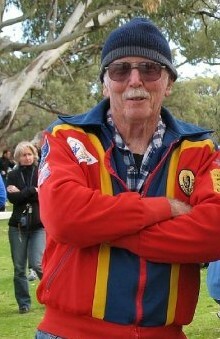 Bill paddled the entire length of the Murray in 2005. He has also crossed Bass Strait in a kayak and has completed more than 20 Murray 400 events. When he is not paddling he likes to travel. Martin Finn has been Race Director of the RPM for 20 years. Over that time he has seen the event develop from a smallish state based paddling marathon to the diverse National event we see today. Martin is a member of the Holdfast Bay Canoe Club and along with wife Stephanie they have been a driving force behind the very successful club. In fact very little happens in South Australian flat water paddling circles without somehow being touched by the hand of Martin. In 2010 Martin deservedly received an award from Australian Canoeing for services to the sport recognising his more than 20 years of service. Martin has been actively involved with Canoe SA for around 20 years. In that time he has developed an Officials training program in both Sprint & Marathon disciplines. In 1999 he became an accredited ICF Sprint Official and was selected as an Official at the 2000 Sydney Olympics. He officiated at the 2005 ICF World Marathon Championship in Perth and gained his ICF Marathon Official accreditation. Martin has taken on some significant roles but would acknowledge that his biggest single task to date was his involvement in the 2009 World Masters Games in Sydney where he was the Chief Official for marathon & Chief/Deputy for the Sprints.